One-third of the world’s shag species are found in New Zealand, where they are icons of lake and coastal landscapes. The diverse shorelines and rich marine and freshwater resources offer many habitats for these elegant, straight-flying birds. 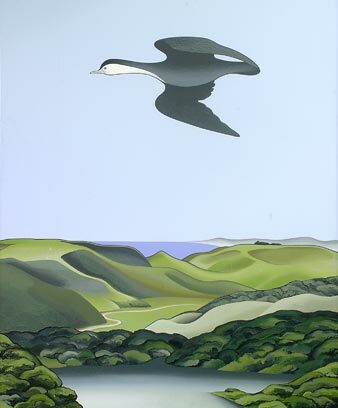 Many New Zealanders have seen a long-necked shag sitting on a rock, or flying like an arrow above the sea. Worldwide there are 36 species of shag (also known as cormorants), and 12 of these are found in New Zealand. They are fully protected by law, except for the black shag. Shags live mostly by the sea, but also near lakes and rivers. Around New Zealand there are many colonies, some with several thousand birds. Some shags eat food from the sea, and others from fresh water, or a mixture of both. Their diet includes fish, crayfish and frogs. Diving for their prey, they chase it underwater, where they can last several minutes without air. Afterwards some species spread their wings in the sun, to dry out quickly. Shags are grouped according to their foot colour. In this group is New Zealand’s most common shag – the black shag, or kawau. There are up to 10,000 breeding pairs, which nest in trees. Also in this group is the little black shag and the pied shag, which live in both freshwater and coastal habitats of the North Island. The little shag is found throughout the country. These birds have variable white markings on their underparts. There are six or seven species in this group. The rare, black-and-white king shag can dive to a depth of 40 metres. In 2012 there were only about 650 king shags, on islands in the Marlborough Sounds. Other pink-footed shags live in Southland and Otago, and on the Chatham Islands and isolated Southern Ocean islands – the Bounty Islands, Auckland Island and Campbell Island. Stewart Island shags have two quite different forms – greenish black, and black-and-white. These may be two distinct species. The two species in this group live only in New Zealand. When breeding, the spotted shag and the Pitt Island shag (Pitt Island is in the Chatham group) display black-spotted feathers and a double crest. There are about 30,000 pairs of spotted shags, which nest in rocks and cliffs, especially in the South Island. The Pitt Island shag lives in smaller groups. There are about 430 pairs.